Showing children the crabs, lobsters and starfishes. Hello, we went to Revere beach on Friday. We brought traps, fishing rods and baits. We also brought the crabs, lobsters and starfishes from when we caught them at South Boston. My co-worker is Annie, she drove us to Revere beach. We brought fishing supplies to the table. We put starfishes, crabs and lobsters inside the bucket filled with ocean water. 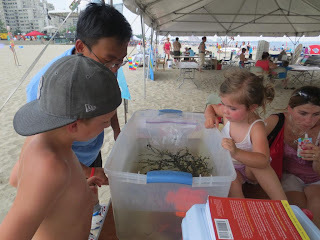 We showed children the starfishes, crabs and lobsters. There was a camera crew and they video taped me showing children the crabs, lobsters and starfishes. Taking a picture at Revere beach while having a lot of fun. After that, we ate lunch, we went to take pictures of sand sculptures. We went to spin a wheel to get prizes. I won a bandage, some of my partner got a water bottle. A lady who worked there gave everyone a water bottle. We got some drinks and played some games. We cleaned our stuff and then we left Revere beach.